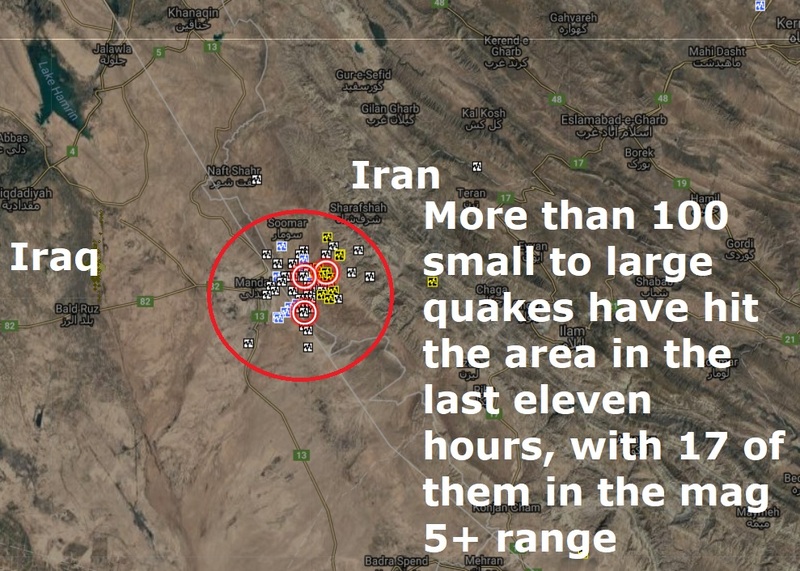 It's one to watch...Is a major quake about to hit the Iran-Iraq border as more than 100 small to large quakes have hit the area in the last eleven hours, with 17 of them in the mag 5+ range with the biggest recorded at mag 5.5. As the US President Donald Trump is expected to announce whether or not he will certify Iranian compliance with a 2015 international nuclear deal on Friday, The Big Wobble has been keeping an eye on Iran since the magnitude 7.3 struck in November which killed 350 people and injuring 4,000. It is one of the most active quake areas in the world and Iran also has 5 nuclear sites and 3 research reactors with the Bushehr nuclear site actually built right on top of a tectonic fault line, it is an accident waiting to happen. Iran was struck by three more big quakes when a mag 6.0 and two magnitude 5.1 aftershocks rocked the Bushehr Nuclear site, which actually sits on a fault line. Two weeks later another mag 6.0 -struck 64km NNE of Kerman, Iran smack in the middle of three uranium mines and the Bushehr nuclear site. On December the 30th Iran was under the earthquake cosh once more as more than 50 quakes struck in just 10 hours with several of them larger than magnitude 4 on the Richter scale. Eight earthquakes struck the Iran-Iraq border area Thursday in apparent aftershocks from a major earthquake that hit the same area in November. More than 530 people died in that earthquake in Iran. In Thursday's quakes, four people suffered minor injuries. The U.S. Geological Survey said seven of the earthquakes hit near the Iraqi city of Mandali, which is just 75 miles northeast of the Iraqi capital. 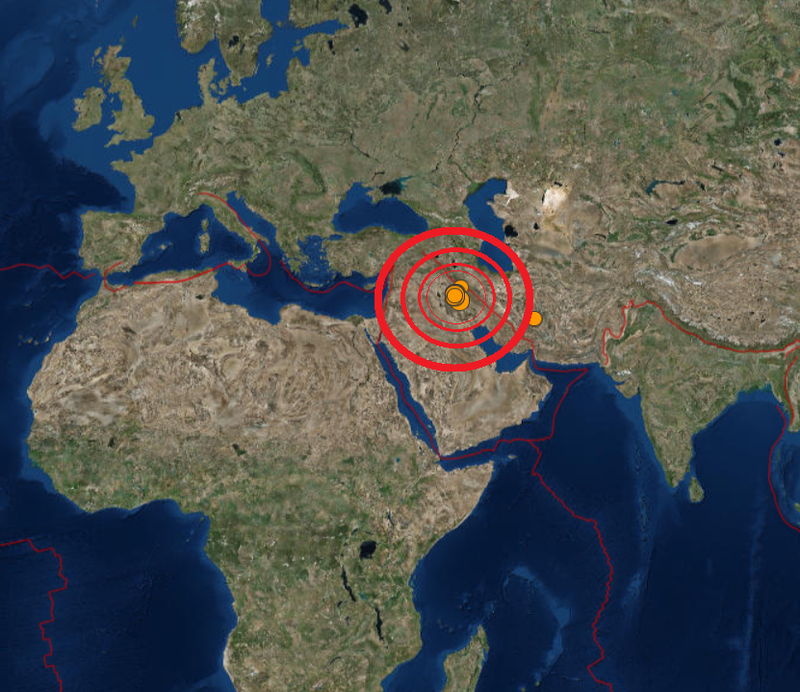 The eighth earthquake struck near Mehran in western Iraq. The earthquakes all hit within an hour of each other. Six had a preliminary magnitude of at least 5 and two registered at magnitude 4, according to reports. Earthquakes that register as 5 are considered moderate. Also, according to the USGS, the earthquakes hit at a depth of about six miles. "It's ongoing activity there," Randy Baldwin, a geophysicist with the USGS told The Associated Press. "If there was a stressed fault that's ready to move, they happen like that until the stresses are relieved, so it's not too unusual." In November, a 7.3 magnitude earthquake hit the same area and killed more than 530 people and injured thousands in Iran. In Iraq, nine people were killed and 550 were injured, according to the United Nations. Many buildings collapsed or sustained major damage in November's quake. Many people are still living in temporary homes and tents. Iran is located over major fault lines and is prone to near-daily earthquakes. The last deadly quake was in 2003, where a 6.6 magnitude earthquake killed 26,000 people in the city of Bam.